The "teenpack" is looking for adventure when they discover a mysterious old lighthouse and the even more mysterious keeper, Rafael. Through the lighthouse, the young teens are transported to Bible times where they interact with timeless characters and learn of a loving God who cares for His people through all the ages. These action-packed, top quality dramas are geared to youth ages 10-15, but are great for the whole family or for classroom use. Creative, easy-to-use PDF study materials are included to help young teens apply the faith-building lessons to their lives. Episode 5: The Invitation Hannah has promised to give her son to God. Now that Sammy knows of his amazing birth, he must choose whether to accept God's plan for his life. Explore how free will interacts with following God's calling in this story. 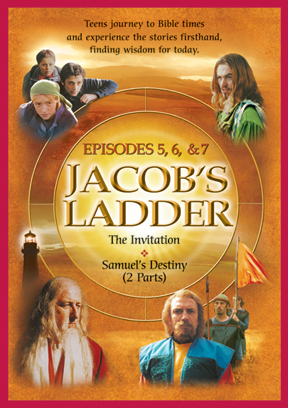 Episode 6: Samuel's Destiny Ü Part 1 As the priest Eli's righthand man, 13-year old Samuel works hard in the temple. Meanwhile Eli's two sons sink deeper into a life of sin. How will these contrasting choices impact the Hebrews and their covenant with God? Episode 7: Samuel's Destiny Ü Part 2 As he begins to hear from God, Samuel transitions into the role of prophet. Meanwhile, the Israelites are marching into battle with the Ark of the Covenant, but without the Lord of Lords. What will it take to convince them to repent and put their faith in God?